Become the sheriff of Moneytown in this classic 3 reel game. Click here to play! You'll have to bring order to the reels and spin the right combos for a chance to reload your bankroll with quite a bit of cash! The big payoff in Moneytown is the number seven. If you can spin this symbol across the pay line, you could be adding up to 6000 credits to your bankroll. Next in line for payouts is the sheriff star, so you'll want to get your hands on this valuable symbol. Spin three of them across the pay line and get up to 600 credits. Triple, double and single BARS will also pay out. 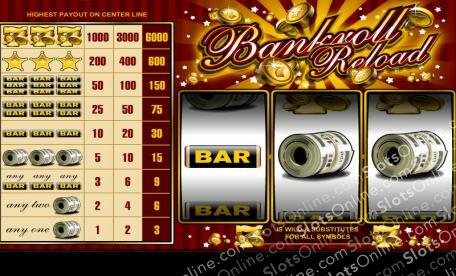 Earn up to 150, 75 or 30 respectively if you spin three of these classic slots symbols. Three rolls of cash will payout, as will any three BARS or any two cash rolls. Remember to wager three coins in order to cash in on the highest pay table. There are plenty of ways to win in this game, especially since it is available in one, three and five pay line versions. Take a few spins on the three reels of Bankroll Reload to become the sheriff of Moneytown. If you're good at this job, you'll bring order to the reels and reload your bankroll with plenty of cash! The golden lucky seven acts as a wild symbol and will replace all other symbols to help you create more winning combinations.